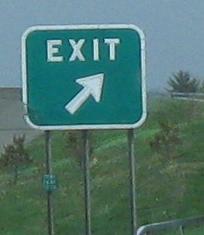 NY 5/8/12 WB/SB at the end of I-790 WB, then on down the exit ramp. Thru Traffic can work as a destination when there are three routes in the mix. I-790 never actually meets I-90, making this a rather unncessary Interstate designation. I don't see how a patchwork route that doesn't connect to its parent can possibly be justified. 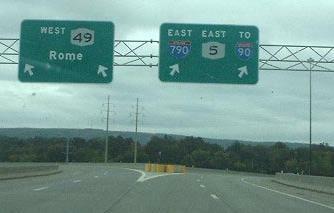 EB at and following the exit from NY 8/12 where suddenly I-790 is signed along NY 5 (which never leaves I-790), then through the ramps to the beginning of NY 49 WB. River Rd. is old 49. 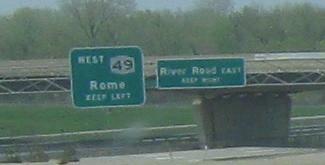 The only problem I have with I-790 signage is that it disappears at either end. In the middle, the shields are everywhere, but there's nary a Begin or an End to be found - the best it does is a few signs from NY 5A and 5S. 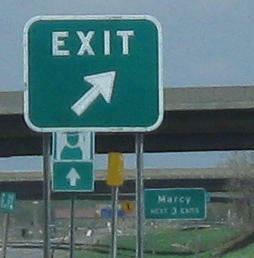 First photo is courtesy Doug Kerr, and has been replaced with one that says EXIT ONLY but lacks button copy. Taken in 1976, when the interchange configuration was clearly different, courtesy Michael Summa. 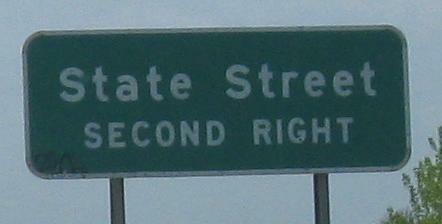 Straight ahead is both NY 12 and 8, just like today. 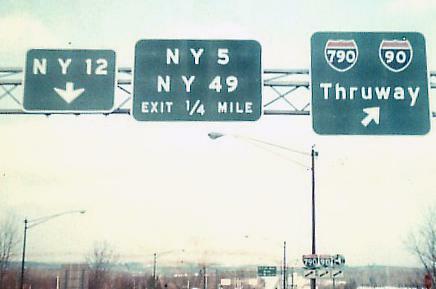 To the right, I-790 was a two-way freeway approach to to the Exit 31 toll plaza, and had a full trumpet interchange with NY 5. It seems that it was a modified trumpet though, such that WB-NB traffic had to make a left across SB-EB traffic. That's hardly Interstate standard! The next interchange was basically a cloverleaf with River Rd., which was NY 49 to the west and then took NY 5 away to the east, becoming another two-way expressway (J.P. Wing says it was not a freeway) and then tying into current 5. So what happened in modern times is that the entire setup was converted to a pair of frontage roads that also continue west (and are now 49). 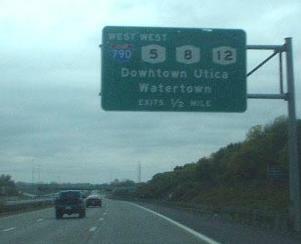 The only eastbound interchange between NY 8/12 and the end of I-790, and the most important one. The only way I-790 is justified is by the fact that there is a direct EB connection to the Exit 31 toll plaza via this ramp. In fact, the ramp to the toll plaza in the third photo is the original route of I-790, which was an undivided Super-2 freeway from NY 5/8/12 to the plaza. Some Genesee St. ramps were added in, the old WB through lane was taken out along with most of the original route west of Genesee St., and frontage roads were added as the new route of I-790. At least it's a multi-lane freeway now, but it still doesn't make sense. 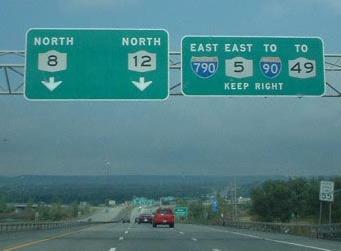 Notice that I-790 is not signed at all once it leaves 8 and 12, at least on overheads (there is an END shield). Westbound, Genesee St. only has an onramp, no offramp from I-790, so the first interchange is already the start of the quadruplex. 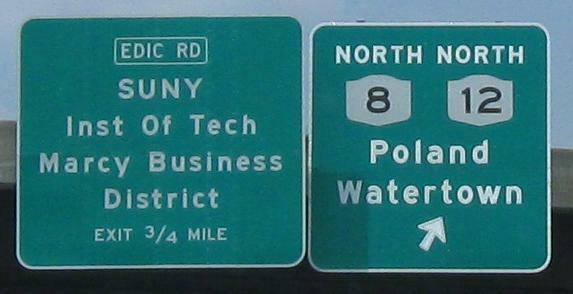 The first photo, from the button copy era, is courtesy Doug Kerr, and J.P. Wing notes that the sign originally had "SOUTH" over each of the 8 and 12 shields, but was greened out because Watertown is NORTH. (He also notes that he is the one who pointed this out to NYSDOT.) The newer advance sign gets very TO-happy. None of these should be TO - all of the ramps lead directly to the stated routes. It remains to be seen after the EB signs are replaced whether I-790 will be signed along either side of I-90 or only when multiplexed with 5/8/12. In some of the photos you see mixed button copy and reflective copy - the button copy dates to the interchange reconfiguration in 1989-1990 according to J.P. Wing, while the other signs may or may not. J.P. thinks they were all installed at the same time, and while I find that bizarre, I wasn't there to disprove it.